Functionality  Multiple usage angles, with integrated stylus holder and access to all ports. With a soft-touch exterior and ultra-slim profile, this sleek case is custom fit for the Dell Venue 8 Pro Model 5830 Tablet. Simply convert the case into a stand for viewing and working on your tablet. The multiple, adjustable viewing angles also allow for comfortable reading and hands free usage of your tablet. 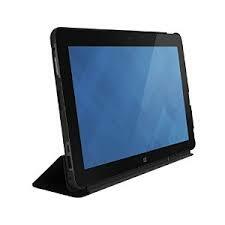 Featuring a smooth matte finish on the exterior, the lightweight and durable hard case helps protect your tablet. The soft-lined interior creates a cushioned surface to help protect the screen and the tablets exterior finish from scratches and marks. For added convenience, the case features a stylus holder to keep a pen or stylus close when you need, it as well as access to all tablet ports. From straightforward browsing on the go, to collaborative projects, work and games, the Dell Venue family of tablets is a popular and versatile choice for anyone from savvy kids to dynamic professionals. With screen sizes that range from 7 inches to 10.8, there’s a tablet for everyone in the Venue range, and the devices are each compatible with a range of useful Dell accessories to make the user experience even better: attach extra docks and useful keyboards for an experience more akin to that of a desktop. The Dell Active Stylus meanwhile allows each device the smoothness and precision that your work – or recreation – deserves. Setting apart the devices in this series is a number of things. Firstly, the more compact devices – models 7 and 8, for example – feature an Android operating system, with mobile broadband and Intel Atom (Dual Core) processors which deliver truly superb battery life. 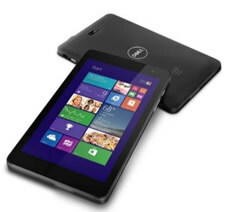 The Dell Venue 7 and 8 are perfect for casual use – whether at home, on the train or at school. Meanwhile, the more advanced models in the Dell Venue range offer an experience better suited to professionals. 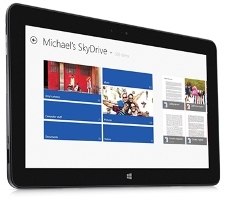 These Windows-operated devices offer features such as wide angle viewing for easy collaboration, a more powerful processor – (Intel Atom Quad Core) – and up to 32GB of memory. With the power of an Ultrabook and the convenience of a tablet, it’s no surprise that these devices are an ever-popular choice for professionals and homes alike. One thing that binds the whole range together is the convenience and style of the design, which never sacrifices quality for gimmicks. With powerful front and back cameras on each model and an emphasis on excellent battery life, superb browsing speeds and all-around user-friendliness, each member of the Dell Venue family is an excellent choice in itself. At ITC Sales, we offer a wide range of new, manufacturer refurbished, open box and ex-demo Dell Venue tablets at prices that make these fantastic products all the more accessible. Our website is continuously updated with new products, so we always have fantastic new offers available – if you can’t find what you’re looking for, you’re always welcome to call us on 03333 2222 00 to check for availability. Our fast UK deliveries will have you setting up your Dell Venue in no time – whichever you choose in the family – with a warranty included. Get your new tablet today.